A two-story, glass-walled colonnade runs the length of Harned Hall overlooking the courtyard and entry to Thompson Hall. Mounted on the interior wall of this colonnade are two mosaics divided in half by the floor of the building’s third story. 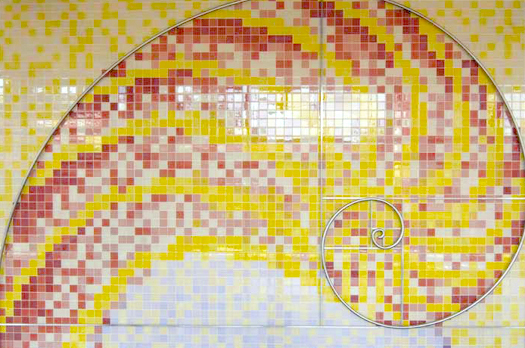 Constructed of 4-inch square tiles, the mosaics are artistic representations of the golden rectangle and the orbits of the planets in our solar system around the sun. 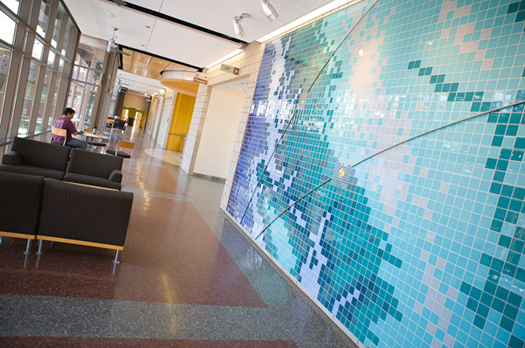 From far away, the colorful tiles create beautiful works of art; from a mid-distance, the principles they represent become clear; and at close range, the designs become abstract again and return to beautiful wall art. The golden rectangle is a unique demonstration of the marriage of symmetry and asymmetry to create a perfect and infinitely repeating pattern. Essentially, it is a rectangle with a length to width ratio such that, if the rectangle were divided into a square and second rectangle, the new rectangle would have the same length-to-width ratio as the original. If the second rectangle, in turn, were divided into a square and third rectangle, the third rectangle would have the same length-to-width ratio as the second, and so on. What’s really fascinating about the golden rectangle is that when the points dividing golden rectangles into squares are connected, a logarithmic spiral is revealed. The same spiral is created in nature in the many "apartments" of the chambered nautilus. This spiral is one example of what is known in mathematics and geometry as a fractal, a shape or pattern that appears similar at all levels of magnification. Another example of a fractal is the Science Center’s courtyard. For thousands of years, the mysteries of the heavens have fed the imagination and fueled the exploration of space. 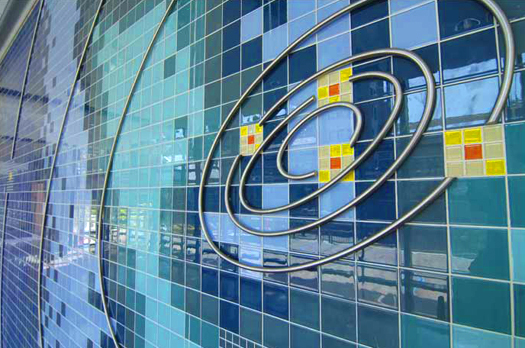 The second of the Science Center's two-story mosaics captures that quest in a depiction of the orbits of the planets, inscribed over a view of the Puget Sound region from space. Steel cables trace each planet’s orbit around the sun.